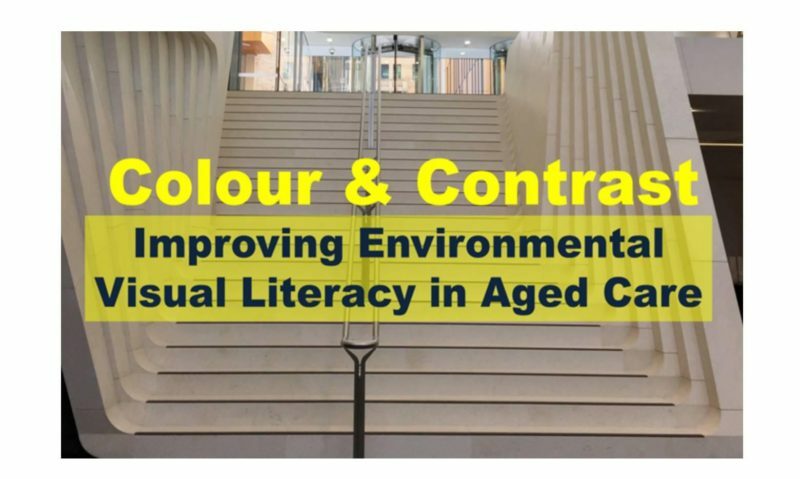 The seminar on Environmental Visual Literacy focussed on colour/contrast strategies to improve environmental visual literacy in healthcare and aged care environments. Along with quality of care and standards compliance, environmental design is a key contributor to meaningful engagement, positive health and well-being outcomes, and quality of life in aged care and dementia facilities. Environmental visual literacy relates to the way in which older people can ‘read’ and interpret their surroundings using visual cues embedded in the environment. When the interface between people and their environment is effective, older people can engage and orientate themselves safely and with ease in aged care facilities. In this way, successful environmental visual literacy can contribute to a safer environment, support meaningful engagement, and improve orientation and way-finding. Effective environmental visual literacy also addresses the issue of declining visual capacity, which occurs from middle age onwards and can become increasingly problematic for older people. In addition, people with dementia suffer from a range of sensory challenges including changes in visual and spatial perception. It is imperative that environmental design addresses these visual challenges and ensures that facilities design is functional and effective. The design of retirement, aged care and dementia facilities often focuses on aesthetic appeal. While its important to appeal to key decision-makers (that is, the sons and daughters of potential residents), aesthetics does not mask poor environmental design. Environmental design for dementia patients is now a key issue despite a disconnect between evidence-based research and environmental design for this cohort. Dr Stephen Judd (CEO, HammondCare) noted that the two most common triggers for agitated, aggressive behaviours among dementia patients are unidentified pain issues and inappropriate environmental issues that lead to confusion. The seminar on environmental visual literacy explores a number of evidence-based colour/contrast strategies. These can be used to improve meaningful engagement for residents and provide visual cues to improve orientation and way-finding thereby supporting safety initiatives and reducing frustration and confusion for people with dementia. In addition, colour/contrast strategies can minimise visual ‘noise’ and support safety initiatives in aged care facilities, making these functionally safer and more meaningful for aged care and dementia residents. In this way, colour/contrast strategies can support and enhance design related to Australian Standard AS1428 as well as Universal Design and Ageing-in-Place principles. Understand the attributes of colour and how these influence visual literacy of the built environment. Understand visual perception and the decline of visual capacity from middle age onwards and the visual and spatial challenges faced by people with dementia. Understand the roles of contrast and colour contrast in visual perception and how these can create focus, attract/divert attention, increase/reduce visual noise, and influence perceptions of engagement, safety and ambience. Identify the range of evidence-based ways that colour and contrast can be used in the built environment to improve visual literacy, intuitive functioning, orientation, wayfinding, signage, and engagement within the built environment. Understand the ways in which colour can be used to address the needs of older people with specific disabilities such as cognitive impairment (Dementia, Alzheimer’s). Explore an environmental visual literacy compliance audit (retirement and aged care facilities). Examine practical solutions to real problems relevant to the retirement and aged care sector. Seminar on Environmental Visual Literacy attracts 3 CPD points for architects and designers.